South Beach welcomes a new addition to the restaurant scene with the opening of Pléthore et Balthazar located inside the Hilton Bentley Hotel located on Ocean Drive and 1st. The creation of Fabien Chalard, Julien Geliot and Chef Diego Amat Lopez, aim to bring the allure of the acclaimed eatery known widely throughout France to South Beach for all to enjoy. 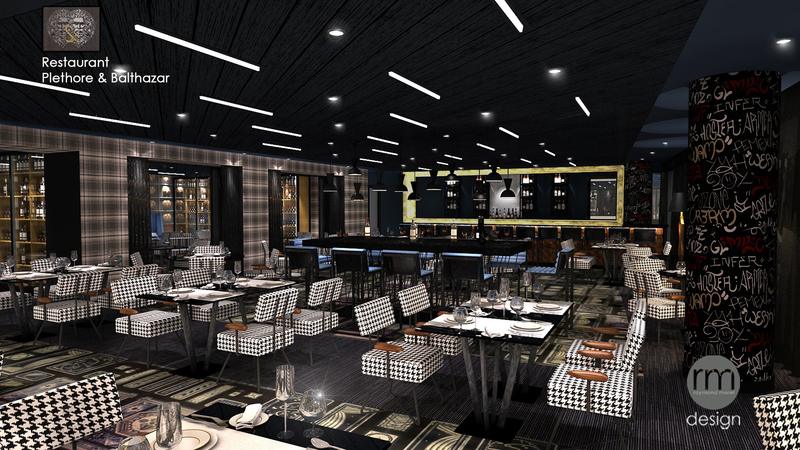 Pléthore et Balthazar, also known as P&B, opening officially this month will have a menu that features traditional French and Spanish-inspired cuisine made with seasonal ingredients and locally sourced vegetables. From tapas to dessert, award-winning Chef Lopez who once owned and headed the “Best Restaurant in Spain” La Estrella de Plata in Barcelona, aims to create an opportunity for everyone to enjoy some of the most exclusive dishes. Items on the tapas menu include Croquetas de Jamon Iberico & Pollo, Iberico ham and chicken croquettes served with béchamel sauce; Steamed Mussels à la Française, fresh tomato sauce, basil, sauvignon wine, pastis; Huevos Rotos “Casa Lucio” Revistados, a 64° egg & warm Iberico ham served with mashed potato & potato chips; and more with portion sizes big enough to share. Follow up with main course offerings ranging from Grilled octopus Salad, Maine Lobster Salad “a la Française”, whole lobster out of shell, Macedonia vegetables, French mayonnaise; Paella Land & Sea, consisting of chicken, clams, calamari, sausage and prawns; Grilled Maine Lobster Thermidor, served with a portobello risotto; and Prime NY Strip “Maitre d’hotel”, served with French Fries on the side. For dessert P&B offers a Bourbon Crème brûlée, Tiramisu, Chocolate Fondant Cake, Key Lime Pie, or you prefer a lighter side, enjoy a delicious platter of fresh fruit. P&B’s approach was to have a spot where locals and travelers alike can indulge in gourmet coffee, tapas, and sandwiches in a laid back environment sitting poolside. Guests will take in the beauty of SOBE with pool-side outdoor seating all while enjoying P&B bites for breakfast or a quick lunch. For those who want to indulge in an after-work cocktail, P&B offers an amazing Happy Hour option from 4 pm until 7pm (extends until 9pm on Tuesday and Friday nights), where guests can enjoy European-style crafted cocktails. One of the most popular choices is the Caribbean Smash, a refreshing mix of tequila, passion fruit, fresh organic mint and homemade Tiki passion syrup or enjoy any beer, wine by the glass, cocktails, well drinks and a delicious menu of tapas all for $7 or less each. On Sundays, make sure to order their hand crafted Bloody Marys perfectly spiced and made to order- perfect for when you’re recovering from the previous night. Cool vibe, beautiful scenery, fashionably chic decor, P&B is a much needed addition that promises to be highly welcomed on South Beach. Pléthore et Balthazar is located in the Bentley Hilton, 101 Ocean Dr, Miami, FL.